VELLORE: There will be a huge turnaround in employment prospects for the engineers in the Information Technology (IT) field soon, thanks to the ambitious target set by the Manufacturers Association for Information Technology (MAIT), according to M. Rafeeque Ahmed, president, Federation of Indian Chambers of Commerce and Industry (FICCI), Tamil Nadu State Council. 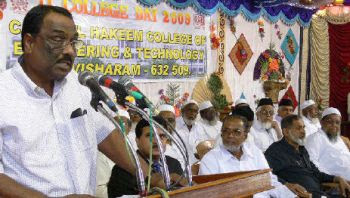 Addressing the 11th College Day celebrations of the C. Abdul Hakeem College of Engineering and Technology (CAHCET) at Melvisharam on Monday, Mr. Rafeeque Ahmed said that MAIT had set a target for the government to create a vibrant domestic IT market with 500 million Internet users as against the present 55 million, 100 million broadband connections as against the present five million, and 100 million connective devices by 2012. The 11th Plan, he said, has envisaged a huge outlay for infrastructure development in the country to make it a developed country. Great stress is being laid on development of world-class highways, ports, railways and communication facilities. With the government committed to encourage these programmes on a public-private partnership basis, youth graduating from other branches of engineering too will have opportunities for gainful employment, he said. Referring to the decline in campus recruitment by the IT industry, the FICCI State president said that recent developments in the country’s economy, though not on the same scale as previous years, has inbuilt potential as against the developed countries. The Gross Domestic Product (GDP) which was growing at the rate of around nine percent per annum since the past four or five years, is estimated to record a growth rate of about seven percent in 2009, next only to that of China. “Though our country may not be immune to the fallout of the global financial crisis, it is likely to fare better than the other developing countries thanks to its domestic market and less reliance on exports”. No doubt the country might miss the overall export target of U.S. $ 170 billion for the leather trade for the current financial year, but experts such as C. Rangarajan, former chairman of the Prime Minister’s Economic Advisory Council predicted that there would be a turnaround in the economy by September 2009. The slowdown in economy also provided opportunities to the students to shape themselves to meet future requirements, he said. M. Mohamed Hashim, Chairman, K.H. Foundation, Melvisharam and former chairman of the Council for Leather Exports, and P.A. Ibrahim, Chairman, P.A. College of Engineering, Mangalore spoke.